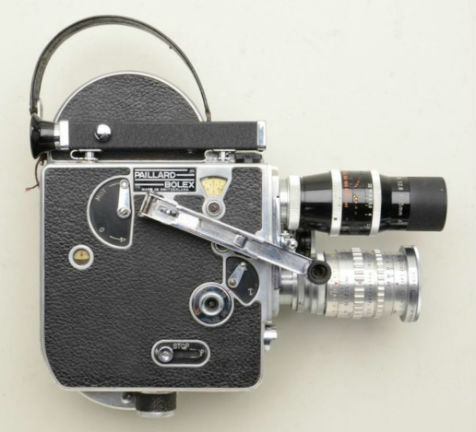 Pictured above is a Bolex H8 Reflex camera from the 1960s manufactured by Paillard Bolex in Switzerland. 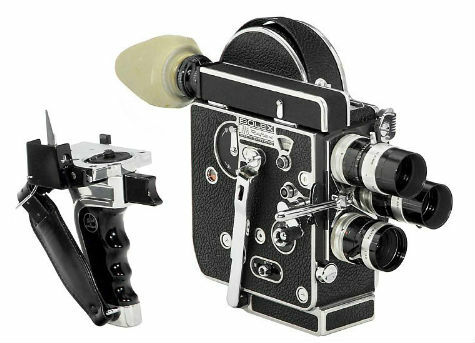 The camera includes 100ft or 30m daylight spools for 8mm film. Powered by spring motor with variable speed with film rates ranging from 12 to 64 per second. Camera includes a rotating turret with three lenses 1:1,6/5,5 mm, 1:1,3/12,5 mm and 1:1,4/36 mm. Another Swiss-made Bolex H-8 Camera from 1955 with triple turret lenses. This entry was posted on Friday, January 3rd, 2014 at 11:50 am	and is filed under Bolex Paillard Movie Cameras. You can follow any comments to this post through the RSS 2.0 feed. Both comments and pings are currently closed.